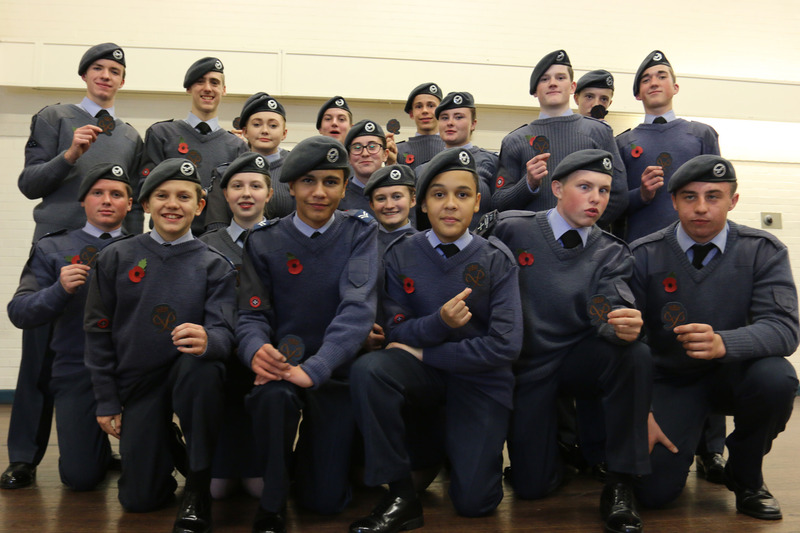 21 Air Cadets from 235 (City of Stoke on Trent) Squadron received their Bronze Duke of Edinburgh Awards during a special presentation at their Cobridge HQ on Thursday (3 Nov). The group, who have been working towards their Bronze over the last six months, were awarded their certificates and badges by Group Captain Roger Simon, Regional Commandant Wales and West Air Cadets, and were also joined by Honorary Squadon President, Ruth Smeeth MP. During a special evening to mark the cadet’s achievements, the award recipients demonstrated the skills they had gained during the award and gave a presentation on their grueling two-day expedition across the Peak district to parents and VIP guests. 2016 marks 60 years of the Duke of Edinburgh Award programme and 75 years of the Air Cadet movement, and with no other Air Cadet unit in Staffordshire having gained such a large number of awards in one year, cadets of 235 squadron were proud to have senior leaders of the Air Cadet organisation present to recognise their efforts. 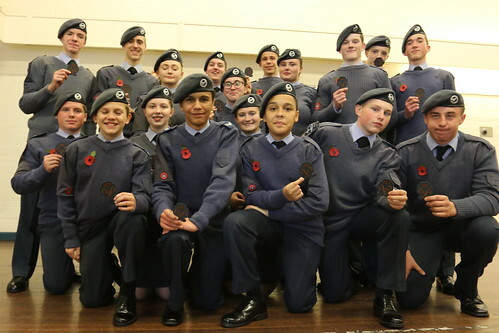 Over the six months of work towards their success, the 21 participants aged between 14-17 covered the three parts of the award; physical recreation, skills and service, with activities such as rock climbing, fitness programs, mentoring younger cadets, aircraft modelling and much more. The award culminated with a series of training sessions and practice expeditions, before the cadets hiked across the Peak District National Park, camping out overnight and carrying all the equipment and supplies they needed on their backs. Celebrating its Diamond Anniversary, the Duke of Edinburgh Award is a nationally recognised programme, which gives young people amazing skills and experiences, pushes their personal boundaries and enhances their CVs and university applications across three levels; Bronze, Silver and Gold. Cpl Saul Mburu was one of award recipients who gave a presentation to the gathered parents and guests. The 16-year-old from Stanfield shared his personal DofE experience and some of the activities that made up his award. He said, “The Duke of Edinburgh Award has been absolutely fantastic experience. From the moment we jumped into our activities six months ago, I’ve enjoyed every moment of it. We’ve been out helping in the community and raising money, I’ve been working on my fitness as part of the physical section and I’m well on my way to gaining a BTEC in Aviation Studies thanks to my skill section. 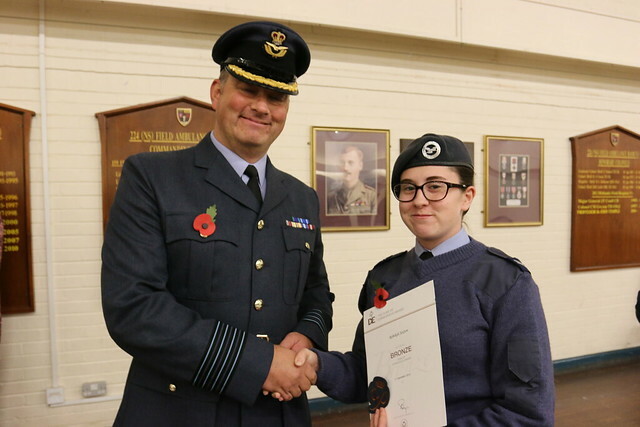 Group Captain Simon, who leads the Air Cadet Organisation across the west of the UK, was ‘honoured’ to be asked to present the awards. “It was a privilege to be invited to Stoke-On-Trent this evening to recognise the significant achievement of these young people. The Air Cadet Organisation is one of the greatest supporters of the Duke of Edinburgh’s Award and the cadets receiving award should be rightly proud of their achievements. The awards will benefit them when they apply for jobs, apprenticeships or move onto further education. What is more, they will have gained valuable life skills and made strong friendships, leaving lasting memories that they will build on as they continue with their Silver and Gold awards. 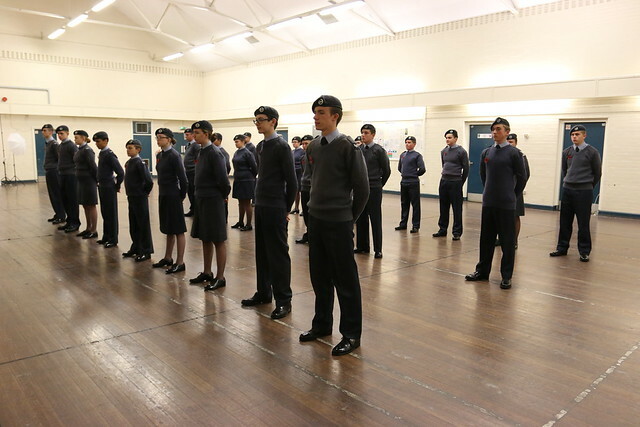 235 (City of Stoke-On-Trent) Squadron doesn’t just provide the Duke of Edinburgh Award to its 40 members. The unit also teaches a range of skills, with opportunities for the cadets to experience the thrill of aerobatics during flying training, visit RAF stations across the UK and overseas, complete BTECs, represent the squadron in several sports, become marksmen with a rifle and so much more. The squadron is open to young people in year 8 or above, with adult volunteers over the age of 20 needed to help the lead activities for just a few hours each week. If you’re interested in finding out more about the air cadets and getting involved visit www.235squadron.co.uk or find the unit on Facebook.